We are always looking for innovations in kitchen appliances, and that’s why we’ve completed this extensive Tower air fryer review. It allows cooking a healthy fat-free dinner in a quick manner with not much of an effort. The advantage of this model is that it uses three methods of cooking, such as halogen, convection and infrared. The glass bowl is also handy as it shows the process of cooking. Due to high functionality and reasonable price Oil Free Air Fryer Oven 19Quart is an amazing kitchen appliance. Tower definitely aren’t a name that spring to mind when you think of revolutionary kitchen technology. Though this is the case, they have tried their hand at making a state-of-the-art Air Fryer as seen on TV, for those that want to enjoy fried food the healthy way. Though this particular model may not be big enough to beat out the outdoor propane deep fryer that some people are used to, it provides a fantastic way of cooking food in a quick and healthy manner. What is immediately impressive about this fryer in particular is the variety of methods it uses to cook food. A combination of 3 methods (halogen, convection and infrared) all combine to give this cooker a tremendous amount of cooking power. Another thing that separates it from the rest is the extension you can put onto it. This increases the Tower Air Fryer’s capacity by so much that it beats out most other competition! The glass bowl is something you do not see utilised enough in Air Fryer’s at the moment, however this does have the look of a bit of a health risk. The extension that you can add to this Air Fryer puts it way higher in the rankings than a lot of its competitors. This extension means you can cook a whole lot of food in one go, a feature that is missing, forgotten or not accomplished on so many other models. 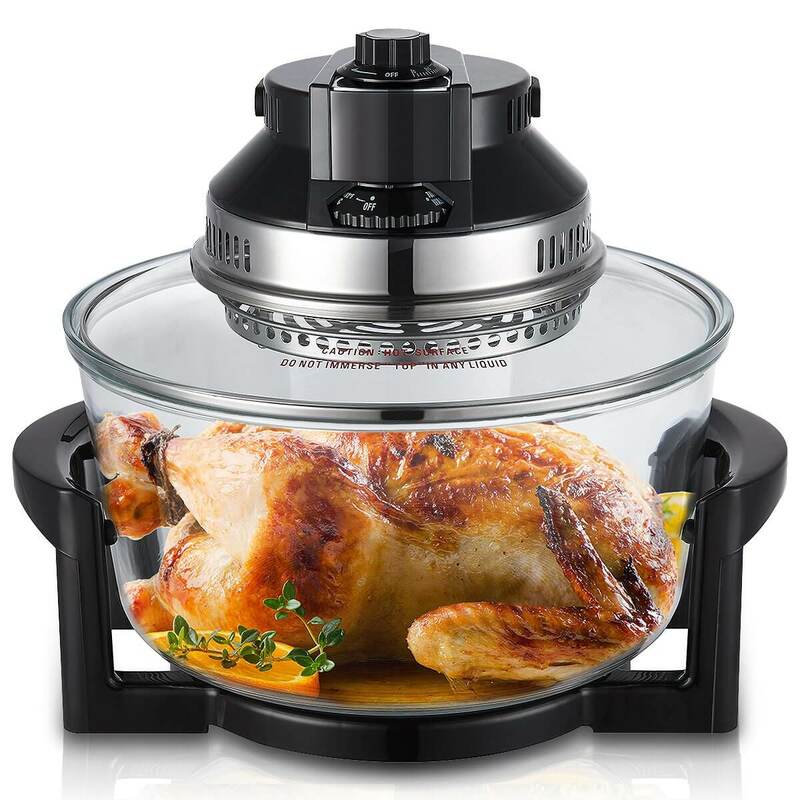 The glass bowl that the Air Fryer uses allows its user to sit back and watch all of the cooking happening right before their eyes. A great safety feature too! The combination of 3 different types of energy combining to give this Fryer a huge cooking power is definitely something to be noted. One of the main problems with this model comes in its use of a glass bowl. Whereas most Air Fryers put a lot of time figuring out a method where the user can pick up their newly cooked food with ease, this doesn’t seem to have happened when creating this model. You must watch out for the glass bowl as it can get extremely hot. The asking price for this particular model makes it an amazing addition to any home or kitchen. With the features that it has, it should be being sold for way more than it is. And though there are a few safety precautions that needed to be taken, it doesn’t take away from the fact that you are getting a quality fryer that will revolutionise the way you cook, providing you with a healthy method of cooking lots of food, quickly too!